Included in the neat press-fit box are a 3-inch spear-point parer, a 2-3/4-inch bird-beak parer, and a 3-inch Santoku parer. Each knife was expertly crafted from high-carbon, no-stain steel in Solingen, Germany, the cutlery capital of the world. For higher precision and edge integrity, the blades were laser cut instead of stamped. Each Wusthof blade is precisely tempered to hold its edge for a great length of time, so external maintenance is rarely required. The knives' unique compound angles taper from the spines to the edges, allowing for sturdy, yet extremely sharp edges. They also taper from the bolsters to the tips to give the knives strength and flexibility. 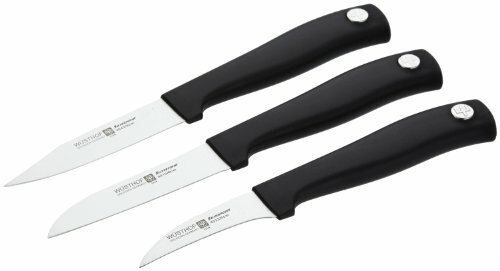 Each knife features a riveted handle with a contoured shape for comfort and control. Washing by hand is recommended for best care.